FMF Racing will begin accepting sponsorship requests on September 1st, 2006 via their website. Polaris Industries is proud to announce the second round of ‘T.R.A.I.L.S.’ grant recipients, with grants totaling $125,871, for a year-to-date total of $395,138 granted to national, state and local ATV clubs. American Honda announced that Honda R&D Japan has developed the world's first Electric Power Steering (EPS) system for All Terrain Vehicles (ATVs). 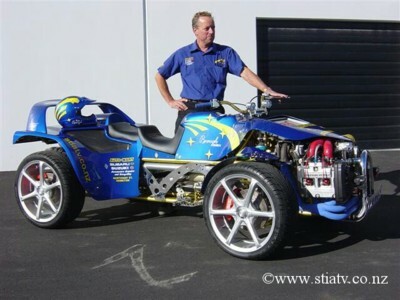 Ken conceived the STi a few years ago while watching television coverage of New Zealand’s famous Race to the Sky – a hillclimb where some of the most radical ATV quads ever assembled get unleashed. Having built a number of speedway cars over the years plus the odd track car or two, Ken’s idea was to build an over-the-top, super ATV quad with the hope of running it in Race to the Sky, doing demonstrations and the auto show circuit and having a wickedly quick road-registered toy. Polaris Industries Inc. announced it has received another delivery order from USSOCOM to ship another 50 Light Weight All-Terrain Vehicles for military applications. Jeremiah Jones (No. 2 Team Suzuki, Yoshimura/Suzuki) suffered a severe back injury during a non-WPSA-affiliated race in Upstate New York last Sunday. Due to the injury, he is not scheduled to compete in the final WPSA PowerSports ATV Tour events scheduled for Aug. 20-21 at Old Bridge Township Raceway Park in Englishtown, N.J. The Tomberlin™ Group, an international manufacturer and distributor of on-road and off-road vehicles announces plans to enter the LSV (Low-Speed-Vehicle) segment. The Tomberlin™ Group is a recognized designer of vehicles with a history of leading market shares in youth ATVs and Go-Karts. The first two vehicles; the E-Merge™ and the ANVIL™ are anticipated later this year. These vehicles will be sold under the newly formed Tomberlin™ Automotive Group. Hatfield-McCoy Regional Recreation Authority (HMRRA) is launching an ATV safety initiative in southern WV elementary schools.